A winter walk reveals things that might be missed during the growing season, when leaves densely cover the trees. The fruits of Hoptrees (Ptelea trifoliata), or Wafer-ash, are among those potentially hidden treasures, hanging in clusters like seasonal ornaments from otherwise bare branches throughout the late fall and winter months. The fruits are samaras, a type of dry fruit (not fleshy like a berry), each with a single seed encased in a papery covering with a winged edge surrounding the seed, designed to help the wind disperse it. Many of the Hoptree’s aliases refer to these fruits. The common name ‘Hoptree’ is a nod to the use of the fruits as a substitute for hops in brewing beer. Another common name for this small tree or shrub is ‘Wafer-ash’, a name that refers to the wafer-like shape of the samaras. Female ash trees also display clusters of fruits through late fall, although ash samaras are shaped like a paddle. Hoptree samaras look more like the samaras of elm trees, a resemblance that is reflected in its genus, ptelea, which means elm tree. In spite of these superficial similarities to elm and ash trees, Hoptrees are not related to either. The Hoptree is a member of the Rue (Rutaceae) family, which also encompasses the genus citrus. Because of this, the Rue family is often called the Citrus family. Like many plant species, Hoptrees produce chemicals to protect themselves from being eaten by foraging animals. All parts of the plant, including leaves, branches and twigs, have glands that release volatile oils when crushed, spraying a light mist on any critter naive enough to browse them, much like the mist produced when pealing a citrus fruit. Fragrant and bitter chemical compounds are discharged, discouraging most potential consumers. For good measure, this spray also contains chemicals that irritate the skin and make it photosensitive. Altogether, it makes for an effective package of deterrents. This is not a plant that is likely to be browsed by deer. But there are a few insects that have evolved to be able to consume these leaves, synthesizing the deterrent chemical compounds in their bodies. These sequestered chemicals help protect the insects from being eaten by other animals. The Giant Swallowtail butterfly is one of the few insect species that uses this and other Rue family members as food plants for their caterpillars. Attacks on Hoptrees by insects or fungi prompt the production of phytoalexins, which are additional protective compounds that have antimicrobial and antifungal properties. Hoptrees produce many chemical compounds that have powerful medicinal uses. 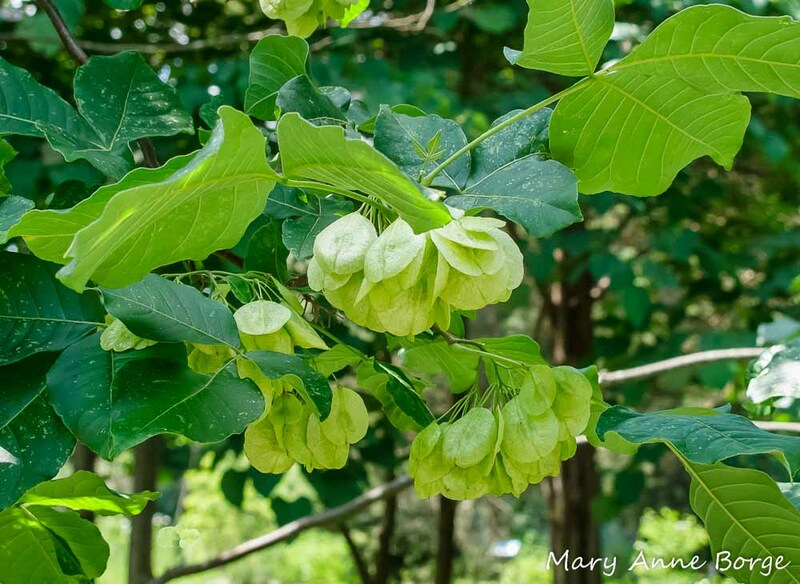 Some Native American tribes, including the Menominees, used Hoptree constituents as a general health panacea or tonic. The Hoptree, like ginseng, is one of a small number of plant species that are believed to be effective in improving the functioning of the human body as a whole. Hoptrees have also been found to have properties that make other medicines more effective. Hoptree flowers bloom in mid-spring, typically May. The flowers are very fragrant, attracting many insect visitors to drink their nectar and potentially assist in pollination, including bees, butterflies, flies and wasps. The northern border of the Hoptree’s native range includes Quebec and Ontario provinces, and Nebraska, Colorado and Utah. The range extends from there to all states to the south from Arizona to Florida. Hoptrees can be found in a variety of habitats, including open woods, thickets, stream banks and prairies. They like well-drained soil, and prefer shade to part-shade, but can tolerate full sun. They are endangered in New Jersey and New York, and threatened in Pennsylvania. Lewis, Walter H.; Elvin-Lewis, Memory P.F. Medical Botany. 2003. 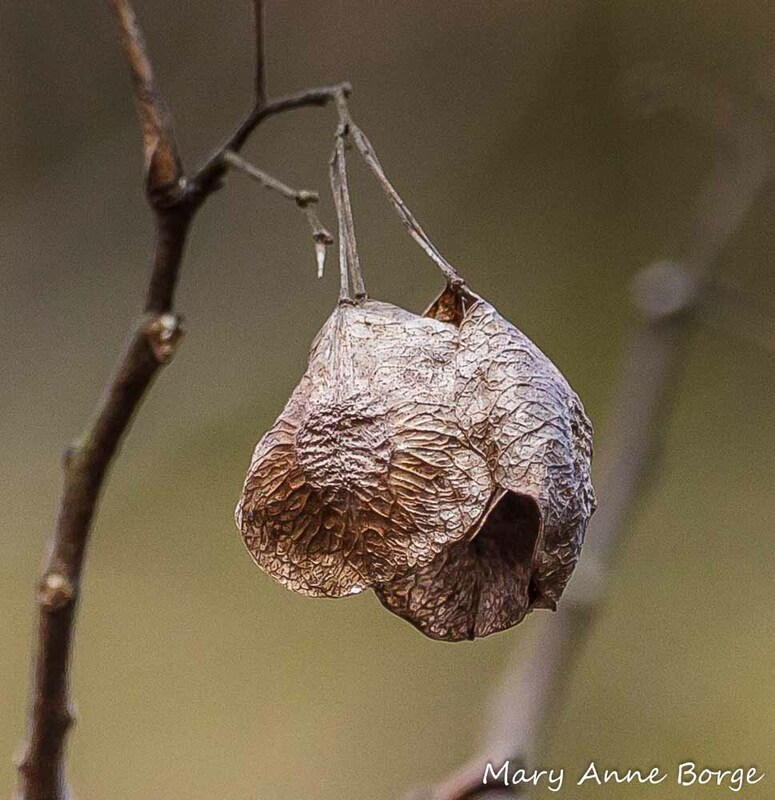 This entry was posted in Butterflies, Medicinal Plants, Native Plants, Other Insects and Spiders and tagged Hoptree, nature, Nature in Winter, Ptelea trifoliata, Wafer-Ash by Mary Anne Borge. Bookmark the permalink. Thanks for the info! I bought a tree at the UT Research Station in Jackson TN called Hop Hornbeam. Is that the same thing? The Wafer Ash grows all along the Lake Erie Shore in Erie PA, where it is allowed to that is. I wasn’t aware it is threatened in Pennsylvania but the way we keep developing our lake shore areas it doesn’t surprise me that it is. I have 2 Wafer Ashes planted in my yard and I can verify that it will attract the Giant Swallowtail, as far north as NW Pennsylvania. It blooms here in late May, early June and is very attractive to early pollinators. I love to crush the blooms and emerging leaves and smell them, they smell like limes and oranges to me. Liked the comment about it looking a bit like Poison Ivy, especially when in the small shrub phase; in fact the personnel in the State Park here keep spraying it; I guess they didn’t know it is threatened or that it isn’t Poison Ivy. Or maybe it is they don’t care. It’s great to know that it’s so prevalent in your area. Maybe you can talk to the state park personnel about it, so they don’t continue to spray it. I’m sure if they realized what it is that they would want to preserve it. Thank you, Mary Anne! Trees/shrubs such as the hoptree do indeed catch my attention on a winter walk, so I found this very informative. 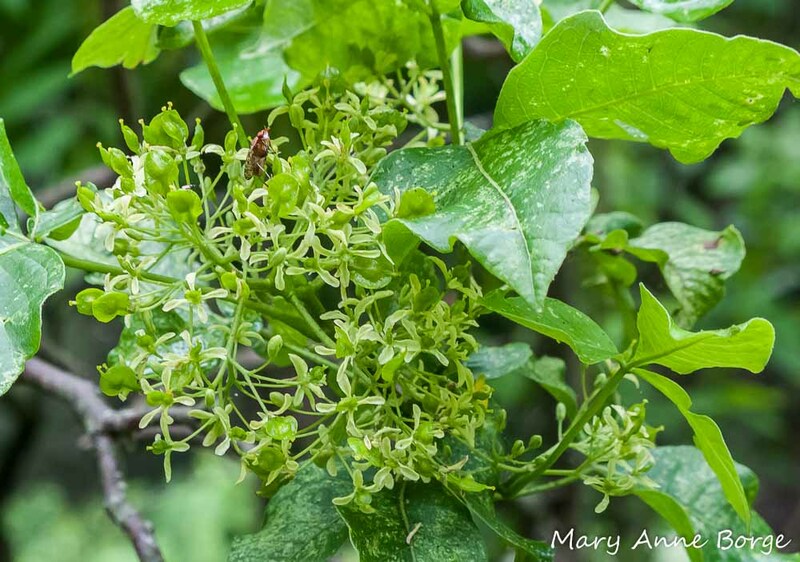 I also have been stopped in my tracks by the beautiful bronze seedpods of bladdernut, Staphylea trifolia. Great observation! I agree, Bladdernut fruit capsules are also very eye-catching. The wonderful inflated fruits float, so water can help disperse the seeds. It’s interesting that both of these shrubs have compound leaves with three leaflets, so when flowers and fruits aren’t visible, they can be mistaken for each other, and sometimes even for poison ivy.